Dinner at Bisl, one of Bozeman’s newest eateries, is all about the details: from the way chef Davey Rabinowitz carefully selects the best seasonal produce, makes his own butter, or maintains the sourdough starter for the bread that’s baked daily to achieve that toothsome crumb and crust, to the custom-made pottery used to serve up the steamy ramen. 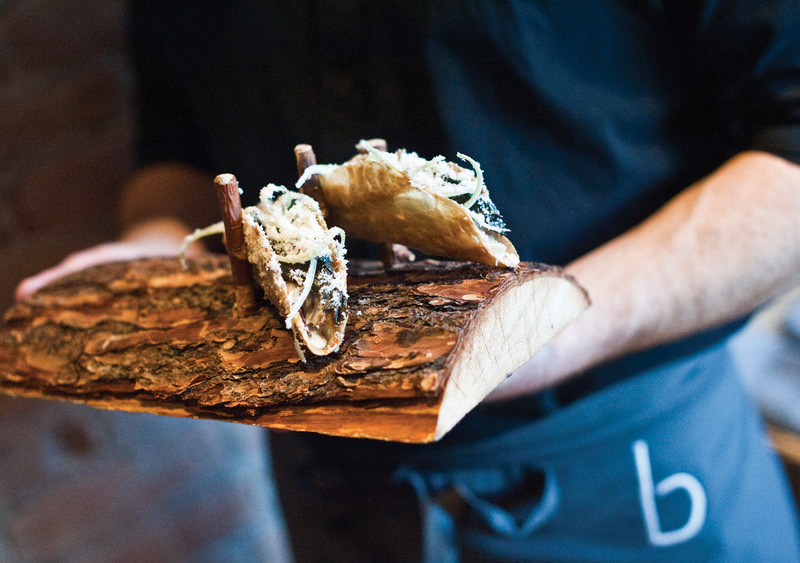 It’s about the way this little restaurant is redefining how you think of a taco (a shell made from crispy chicken skin) or consider how a steak is cooked (sous vide for absolute tenderness). “We want the small things to define us,” said Rabinowitz, who together with his wife, Kierst, opened Bisl in April last year. Bisl’s ever-changing menu is divided into five parts: bites, greens, plates, primaries, and sweets. Diners often ask about the order in which they should select the courses for a meal, but the thing is, Bisl is the kind of restaurant where you get to make things up as you go. So if you want to eat light, then just go with bites. Or order only from the greens section if you like (right now the three dishes are roasted beets with pickled cherries, buttermilk, feta, and butter squash; smoked carrot with maple, kale, and crème fraîche; and a wok-fired wild mushroom bowl of spice and tang and spinach that will soon become your go-to once a week). What the heck, skip the formality and jump straight to dessert for the housemade Roughstock Whiskey ice cream with a warm doughnut, chocolate, and parsley (of all things!). At Bisl, dinner isn’t about following the rules, it’s about eating good food. 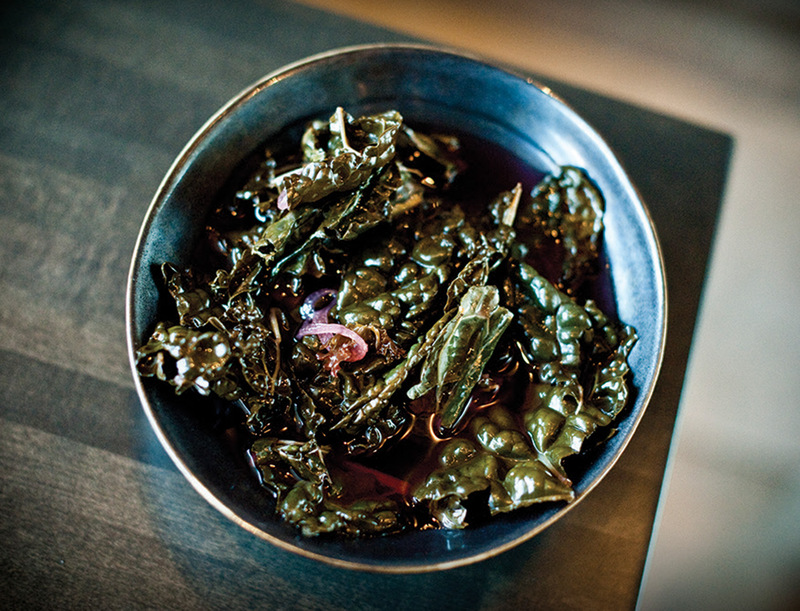 “We call our style of food ‘farm-made modern,’” explained Kierst, who is also a trained chef. 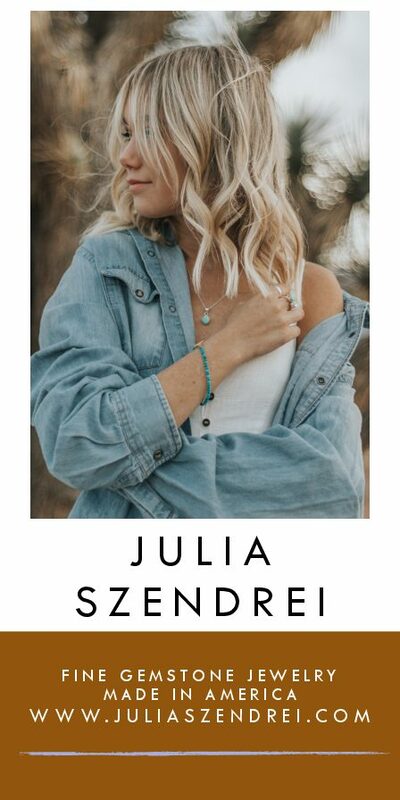 She and Rabinowitz met at culinary school in Portland, Oregon. They both worked in the kitchen at Departure Restaurant + Lounge, an Asian-inspired Portland eater’s favorite. Later, Rabinowitz apprenticed in Copenhagen at Restaurant Relae (ranked as one of the world’s 50 best restaurants), where he learned some of the ingredient-driven techniques of New Nordic cooking. Afterward the young couple looked for a place to follow the dream of opening their own restaurant. Rabinowitz got his start in Bozeman, and returning to his roots made sense. 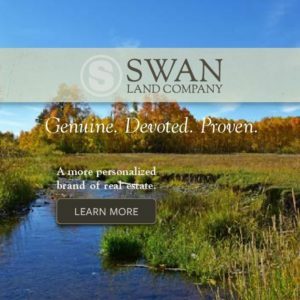 He had attended Montana State University as a sustainable foods major and paid the bills by cooking at Starky’s, where, at age 21, he held his first chef position. The experience inspired him to pursue cooking as a career. Five years later, Rabinowitz stands in his own kitchen, with Kierst, 24, managing the front of the house and finances. Opening a restaurant has been a great adventure so far, they both agree, but the endeavor required tireless dedication. 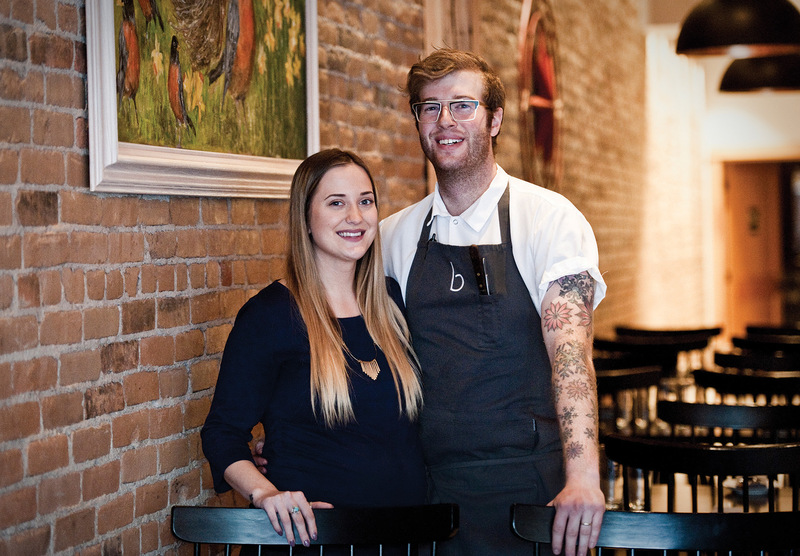 During renovation of the downtown location — formerly Poor Richard’s — the Rabinowitzes created a business plan, drafted a menu, hired staff, and welcomed their first child; now, 18 months later, they are expecting their second baby. “Opening this restaurant is the hardest thing I’ve ever done,” said Kierst, while testing the texture of freshly made dough for the evening’s preparation of steamed crab buns. 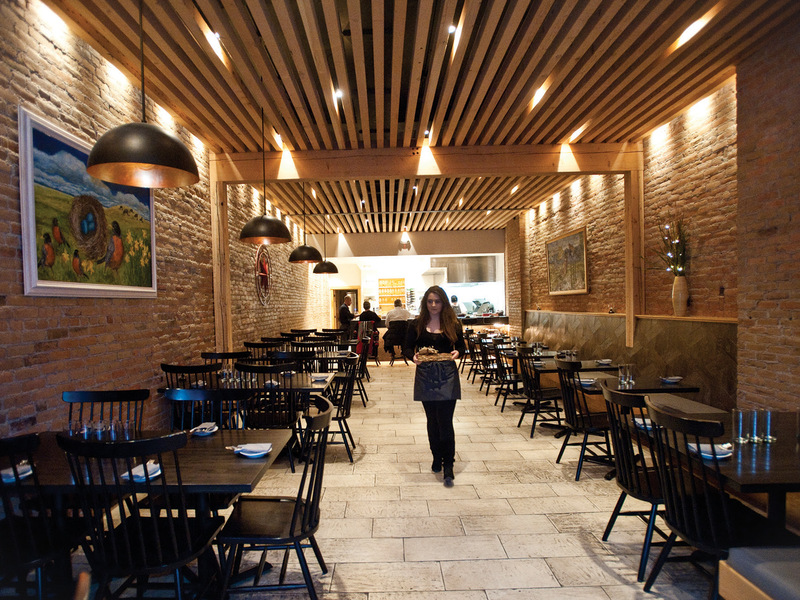 Accepting the reality-check, Rabinowitz concurred that popular culture makes owning a restaurant seem glamorous and holds up chefs as akin to rock stars. That passion and drive is visible every night at Bisl in Rabinowitz’s open kitchen, where he teams up with sous chef David Willis and chef de partie Austin Quinn to crank out delectable food that you have not eaten anywhere else in town. It’s not that you can’t find duck or chicken or Brussel sprouts anywhere else, it’s just that Rabinowitz redefines that duck. He won’t cook and plate a typical preparation but instead presents a taste-bud-popping, sugar-rosemary-cured duck breast that’s grilled, compressed, and grilled again, then served with pickled and grilled cippolini onions and a puréed grilled pumpkin drizzled with a sauce made from hazelnut milk. Yes, that’s a mouthful to say outright, but in your mouth it’s the ultimate balance of savory-fatty-sugary-salty succulence. That’s what happens when you aren’t afraid to push the boundaries — even eating can be reimagined. Combine all ingredients and bring to a boil. Make sure sugar is dissolved. Let cool. Chill in the refrigerator in the pickling liquid. It should keep for six weeks in a sealed container. with the acid in the pickled kale. Makes 1 quart. 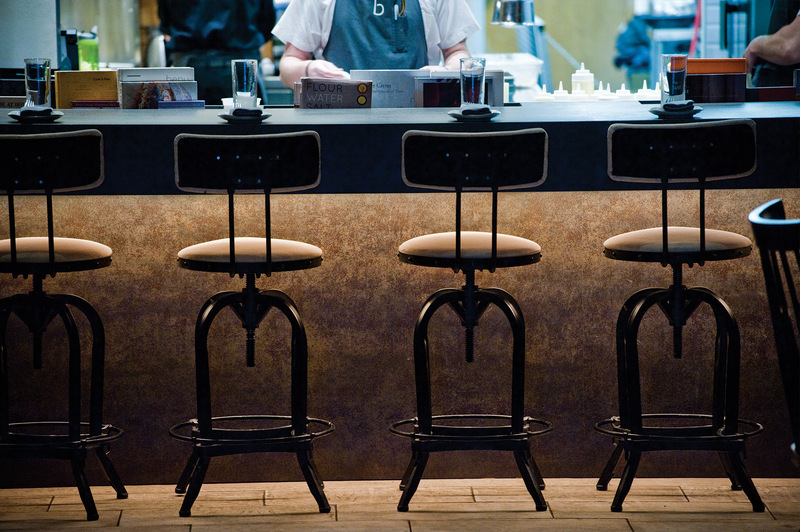 Five seats at the bar were meant to connect guests sitting here with the open kitchen. 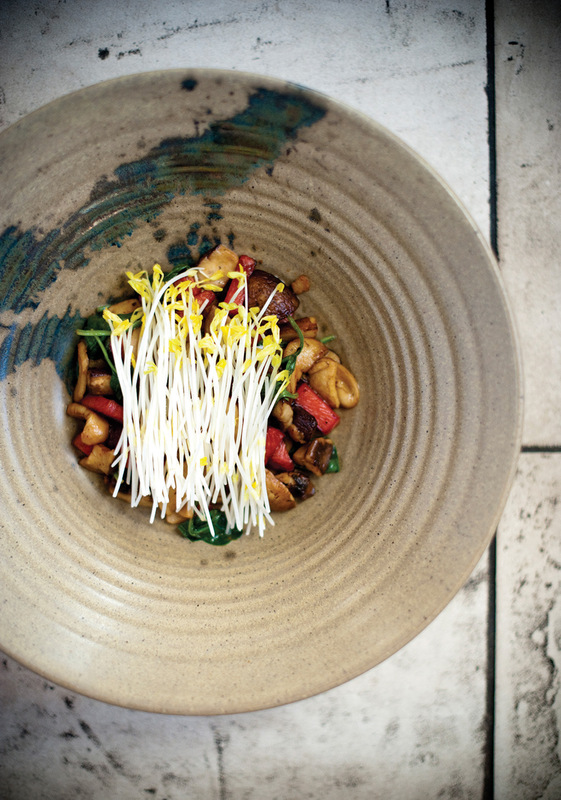 Wok-fired wild mushrooms with pickled radish, spinach, and chili in a ceramic bowl made by a local artist. After a major renovation, reclaimed wood, earth tones, exposed brick walls, and metal accents were incorporated to evoke the feeling of an urban lodge. 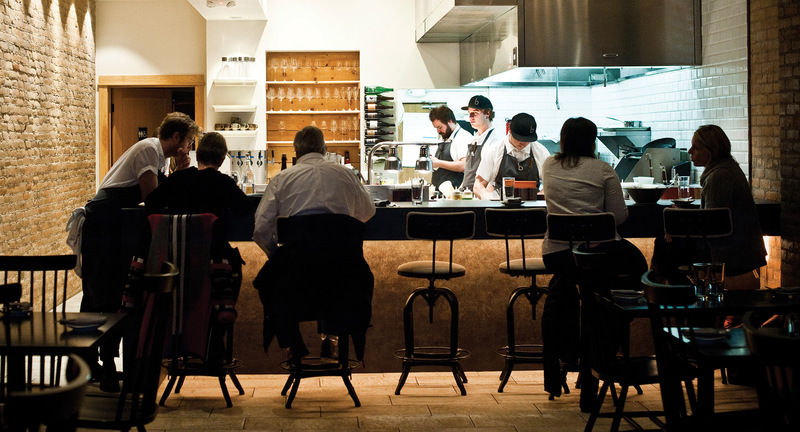 The open industrial kitchen is compact and action packed when the chefs wok-fire, grill, and plate each dish. The crispy chicken skin taco is topped with chicken confit, pickled kale, and pepper jack cheese. 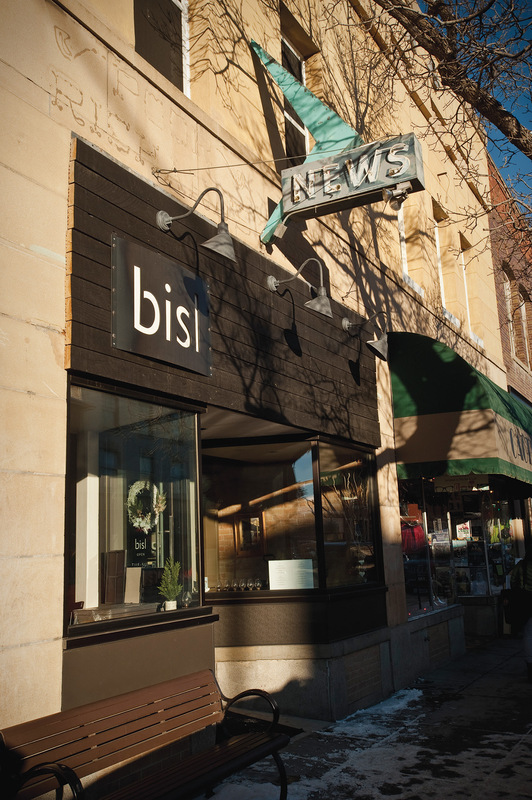 Chef-owners Kierst and Davey Rabinowitz met at culinary school and launched Bisl on Main Street in Bozeman’s historic downtown. 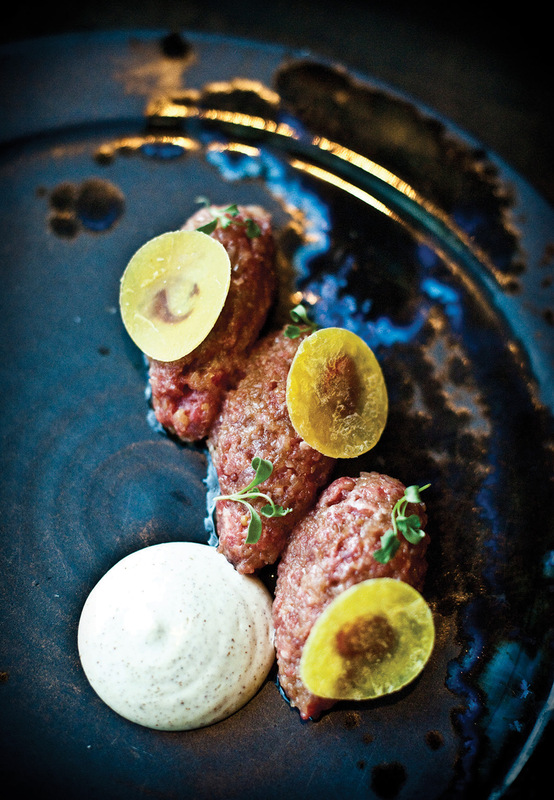 Quenelles of beef tartare garnished with sourdough, rose hip, and mustard. The name Bisl means “a little bit” in Yiddish. Housed in the former Poor Richard’s News and Tobacco store, a vintage sign still hangs above the contemporary restaurant’s signage.